The National Council for the Blind of Ireland (NCBI) launched its second annual national Dine in the Dark week at an exclusive event in The Dylan Hotel last night, Monday 9th October. From 5th – 12th November, restaurants all over the country will Dine in the Dark to raise vital funds for life-changing sight loss services in Ireland. We engage all of our senses when we eat – taste, smell, sight, hearing and touch. So what happens when we eliminate one of them? Not only is taste heightened, but how we communicate with each other changes when we can’t rely on visual cues and the sounds around us take on new meaning. By wearing blindfolds, Dine in the Dark customers have a truly immersive experience, as normal barriers collapse and guests begin to feast their imagination, not their eyes. There are currently 51,718 people with sight loss in Ireland  and this number is rising. “Early intervention is essential to ensuring that anyone experiencing sight loss can live an active and independent life. When we think of living with sight loss it’s easy to focus on the practical difficulties that must be overcome, but there is also a huge psychological impact. Depression is a frequent complication. In fact, rates of depression among older people with vision impairments are at least twice those of the general population  and seven times those of their sighted peers .” said Chris. 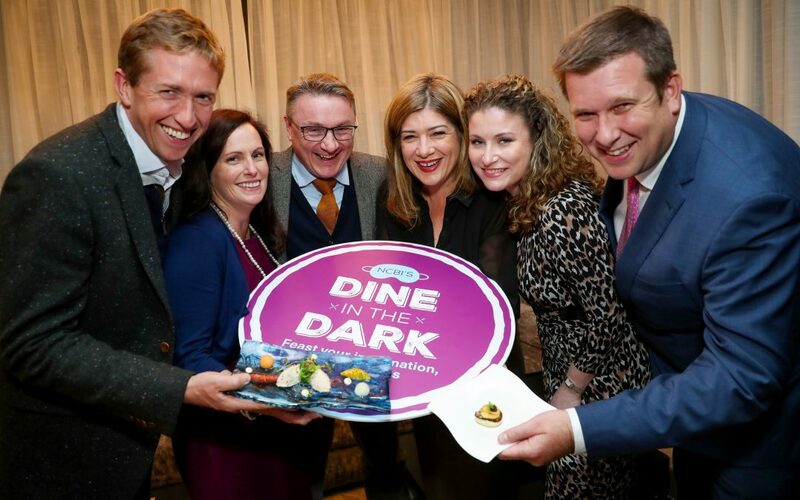 Funds raised through Dine in the Dark will support NCBI’s emotional support, advice and counselling services so the charity is encouraging every restaurant in Ireland to get involved in the campaign, which is now in its second year. Restaurants can register easily online and the lists of participating restaurants can also be found at www.dineinthedark.ie. Follow the online conversation using #Dine4NCBI and following Dine in the Dark on Facebook, Twitter, Instagram and Snapchat. Dine in the Dark is run in partnership with the Restaurants Association of Ireland (RAI) and is sponsored by Novartis, Fujitsu, Dawn Meats and Classic Drinks. For more information please contact Róisín Maxwell on roisin.maxwell@ncbi.ie, 01 2710121/ 085 7628536. Amie Hynes-Fitzpatrick (NCBI) guiding Jules Mahon (Thetaste.ie), Sarah Hanrahan (I come undone) and Cathal Kenny. L-R: David Flynn (Dawn Meats), Catheleen Doohan (Fujitsu), Chris White (NCBI), Doreen Curran (Novartis), Jenny Coppins (Novartis), Adrian Cummins (RAI). NCBI (National Council for the Blind of Ireland) is Ireland’s national charity working for the rising number of people affected by sight loss. Its practical and emotional advice and supports help 8,000 people and their families face their futures with confidence every year. Novartis is one of Ireland’s leading employers in the healthcare industry. One of the first pharmaceutical companies to locate in Ireland in the 1950s, Novartis has strong history of investing in Ireland over the last sixty years. Dawn Meats Foodservice are an Irish company providing consistently high quality meat products from sustainable sources directly to foodservice end users nationwide. Dawn Meats are in business for over 30 years dealing with over 20,000 farmers which enables them to offer a truly farm to fork solution for your business. Classic Drinks take great pride in providing a complete service to the on trade throughout Ireland. Classic Drinks are very privileged to bring to our customers a range of hand-picked wines coming directly from wineries throughout the world. Classic Drinks and their winemakers share the same philosophy “the customer is the priority”. Burmedi, et al., (2002) Emotional and social consequences of age-related low vision. McManus and Lord 2012 Circumstances of People with Sight Loss.